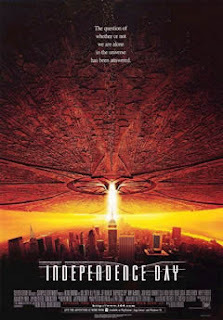 Tag line: "The question of whether or not we are alone in the universe has been answered"
A few critics weren't kind to 1996’s sci-fi blockbuster, Independence Day, calling it, among other things, syrupy, loud, dumb, clunky, and disappointing. I can't really argue with some of their observations (especially “loud”), yet would also add “fun” to the list. I fully realize this film has moments that are as cheesy and cornball as they come, but I gotta say, I have a great time whenever I watch it! As the July 4th weekend gets underway, mankind is suddenly and unexpectedly visited by beings from another world, who've traveled to earth in enormous spaceships that they've positioned over the planet’s largest cities, disrupting satellite communications on a global scale. David Levinson (Jeff Goldblum), a technician for a New York-based cable network, has determined this satellite interruption is the result of an encoded signal being passed between the visiting spaceships, one which serves as a countdown to an attack. David tries to warn his ex-wife, Constance (Margaret Colin), who's the Press Secretary for American President Thomas Whitmore (Bill Pullman), but his warnings arrive too late. After a devastating first attack in which New York, Los Angeles and Washington D.C. are completely destroyed, the U.S. responds by sending a squad of highly-trained Marine pilots, commanded by Captain Steve Hiller (Wil Smith), against the invading extraterrestrials. When their technology proves too powerful for the military to overcome, President Whitmore is left with a limited number of options, and all hope for mankind's survival seems to be fading quickly. But humanity isn’t beaten yet, and may have a trick or two left up its sleeve that'll give the alien invaders a run for their money. Independence Day has a few things going for it, not the least of which is Wil Smith. Having appeared in only a handful of movies prior to this one, Smith shows real confidence as Hiller, the hot-shot fighter pilot, and it was this film that established him as an actor capable of playing the lead in big-budget Sci-Fi productions (like Men in Black, I, Robot and I Am Legend). Also, there are those who scoffed at the notion Jeff Goldblum’s David, whose character is essentially a repair man, would be the first earthling to crack the alien code. Personally, I had no problem with this; in the right role, Goldblum is an actor who commands your attention, and I feel he did a fine enough job here to warrant making his David yet another of Independence Day's unlikely heroes. And...ahem...well...I always get a bit choked up when the world joins forces to combat the alien threat! Yeah, I know it's hokey, but, for me, it worked. And since I'm laying it all out there, I confess to enjoying the scene where Pullman's President Whitmore delivers his inspirational speech just before the big battle, telling a rag-tag team of hastily-assembled pilots that humanity “will not go quietly into the night”. Schmaltzy? Sure. Effective? Hell, yeah! Agree with you wholeheartedly. A movie with all the bells and whistles. My cousin and I went to w tach this in the cinema and we sat quietly and stared at the screen, 'which is very rare'. I hear they have a story for a sequel, I wonder?